This image taken by NASA's Cassini spacecraft on Dec. 1, 2000, shows details of Jupiter's Great Red Spot and other features that were not visible in images taken earlier, when Cassini was farther from Jupiter. The picture is a color composite, with enhanced contrast, taken from a distance of 28.6 million kilometers (17.8 million miles). It has a resolution of 170 kilometers (106 miles) per pixel. Jupiter's closest large moon, Io, is visible at left. The edges of the Red Spot are cloudier with ammonia haze than the spot's center is. The filamentary structure in the center appears to spiral outward toward the edge. NASA's Galileo spacecraft has previously observed the outer edges of the Red Spot to be rotating rapidly counterclockwise, while the inner portion was rotating weakly in the opposite direction. Whether the same is true now will be answered as Cassini gets closer to Jupiter and interior cloud features become sharper. Cassini will make its closest approach to Jupiter, at a distance of about 10 million kilometers (6 million miles), on Dec. 30, 2000. The Red Spot region has changed in one notable way over the years: In images from NASA's Voyager and Galileo spacecraft, the area surrounding the Red Spot is dark, indicating relatively cloud-free conditions. Now, some bright white ammonia clouds have filled in the clearings. 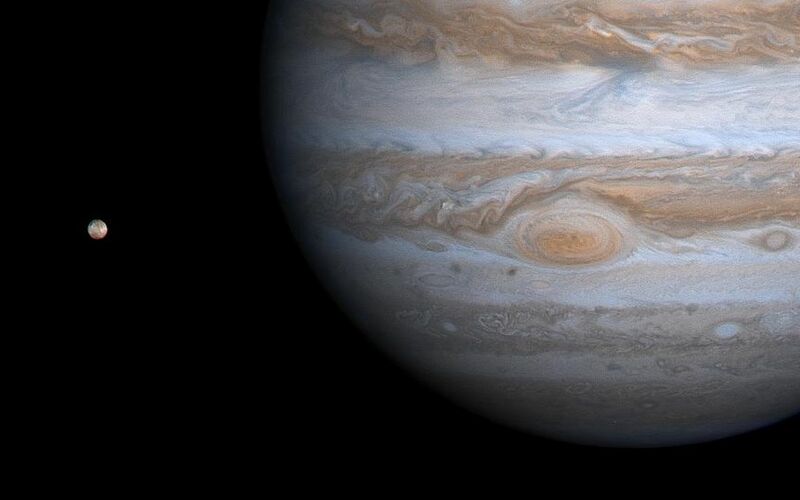 This appears to be part of a general brightening of Jupiter's cloud features during the past two decades. 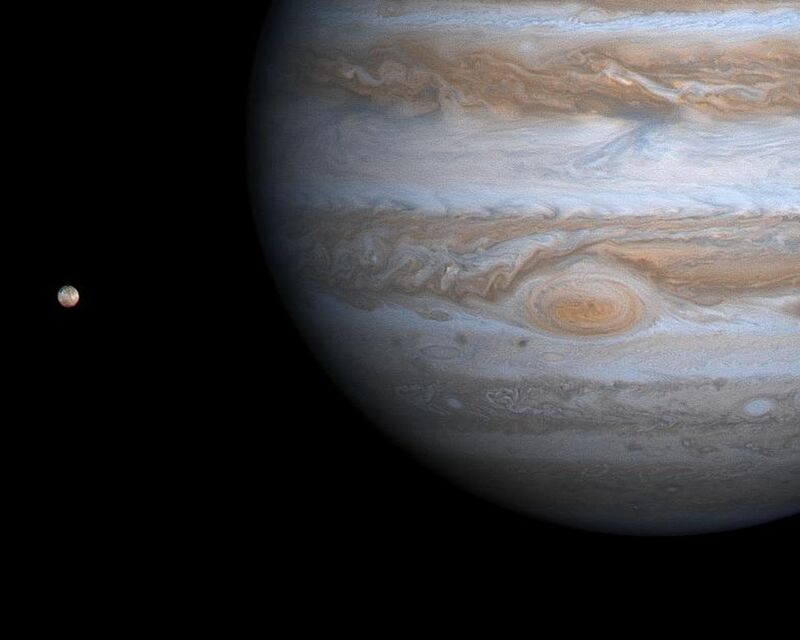 Jupiter has four large moons and an array of tiny ones. In this picture, Io is visible. The white and reddish colors on Io's surface are due to the presence of different sulfurous materials while the black areas are due to silicate rocks. Like the other large moons, Io always keeps the same hemisphere facing Jupiter, called the sub-Jupiter hemisphere. The opposite side, much of which we see here, is the anti-Jupiter hemisphere. Io has more than 100 active volcanoes spewing very hot lava and giant plumes of gas and dust. Its biggest plume, Pele, is near the bottom left edge of Io's disk as seen here.